New to 3A Composites’ lines of graphic display boards is FiberMate™ recyclable rigid print media in the NEW 5.5mm thickness. This new thickness is the second in the FiberMate line, which was introduced in 2012. 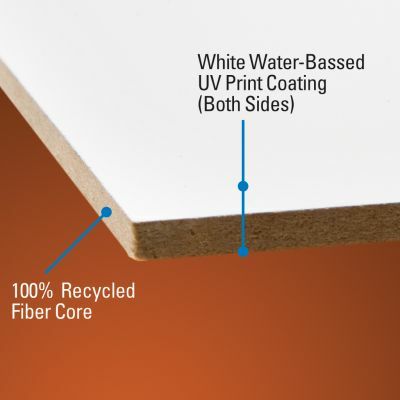 Recyclable FiberMate is comprised of wood fiber that is manufactured into a high-density fiberboard. FiberMate graphic display boards are finished with Eco-Finish™ – a white water-based UV print coating on both sides. FiberMate’s Eco-Finish is designed to provide excellent ink and paint adhesion on both sides of this graphic display board, enabling double-sided printing and other double-sided finishing applications. FiberMate can be recycled in either “wood” or “paper” waste streams depending on local community resources and providing that printing inks and/or mounting or other finishing materials applied to the media also are recyclable. FiberMate with Eco-Finish is CARB (California Air Resource Board) compliant. FiberMate joins 3A Composites’ lines of well-known graphic display boards, including: Fome-Cor® board, the original paper-faced foam board; Omni-Flute™ fluted polypropylene board; Sintra® expanded PVC board; Gator® heavy-duty foam board; and Dibond® aluminum composite material. Dibond is the lighter-weight cousin of Alucobond® (www.AlucobondUSA.com) aluminum composite material, which consists of two sheets of 0.020” aluminum thermobonded to a plastic core. Alucobond provides extraordinary flatness and rigidity, excellent formability, low weight and outstanding weather resistance. Alucobond panels have been utilized in the architectural market as building cladding and to create corporate identity signage for more than 40 years. Both Dibond and Alucobond are used to create durable exterior signage. GlobalShop 2013 show-goers are invited to pick up samples of both 3A Composites’ graphic display boards and architectural panels at Booth No. 1222.